This article describes you the step by step procedure to integrate DRBD with Pacemaker Clusters for High Availability Apache Web server on RHEL7 / CentOS7. Using Pacemaker and DRBD are a complete cost-effective solution for many High Availability situations. Also refer this below links to know more about DRBD and Pacemakers. Because in this article, We give you only the procedure to Integrate DRBD with Pacemaker Clusters on Linux. Dedicated network device for Data replication : 172.16.2.61 and 172.16.2.62 respectively. Dedicated Local disk : /dev/sdb and preferably same size on each nodes. 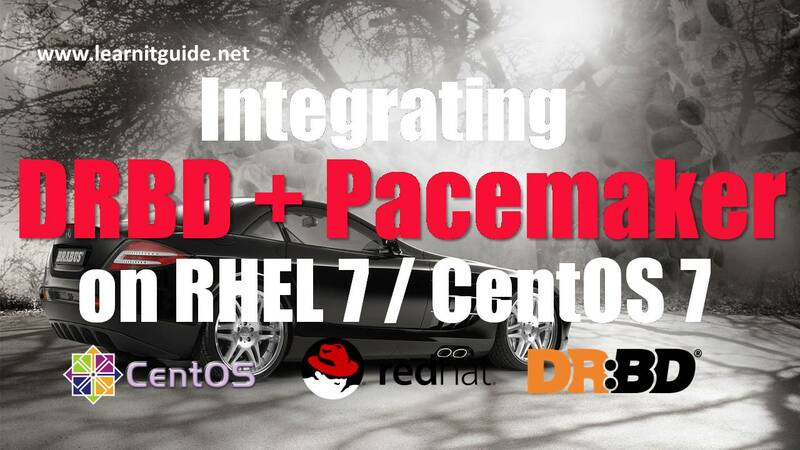 Use the following procedure to integrate DRBD with Pacemaker Clusters for High Availability Apache Web server on RHEL7 / CentOS7. 1. Make sure both node1 and node2 are reachable. 2. Make an entry of each nodes for name resolution in /etc/hosts file or configure the nodes in DNS. Refer this link to configure the DNS Server on RHEL7 / CentOS7. 3. Yum repo enabled, refer this link to Configure YUM Repo Server on Linux. 4. Internet connection needed if you prefer to install DRBD software through internet. If you are using Linux VM's, and dont know how to provide the internet access to VM's, Refer this link to configure internet to linux guest OS virtual machines. 1. Install Apache Web server packages (httpd). 3. Configure the Cluster with Pacemaker and Corosync. 10. Testing the fail-over manually. Install the appropriate Apache Web server package "httpd" on both nodes using yum to avoid dependencies issue. Note : If iptables enabled on your environment, allow apache (http) service to accept the connection on both nodes. Install the Cluster packages on both nodes using yum to avoid dependencies issue. Note : If iptables enabled on your environment, allow cluster related services to accept the connection on both nodes. Once the Cluster software packages are installed, reset the password of the user "hacluster" on both nodes which was created during the Cluster packages installation and this user will be used to authenticate the cluster nodes. On both nodes, start and enable the pcsd daemon. Configure corosync on the first node “node1”, first authenticate the Cluster nodes membership using the user "hacluster"
Just give the password of hacluster when its prompting for the password as above or just bypass the password like below. where "redhat" is my hacluster’s user password. Lets define the Cluster name and Cluster nodes on first node “node1” using pcs command, which generate and synchronize the corosync configuration. Where “mycluster” is my cluster name. On node1, Start and enable the cluster..
Once you have started, Cluster configuration file /etc/corosync/corosync.conf will be generated on both nodes. On both nodes, check the cluster status. STONITH also known as fencing to protects your data from being corrupted by rogue nodes or unintended concurrent access. We just disabled this future, hence we dont have shared filesystem. Please refer the below link to know more about DRBD in detail. Method 1 : Download the latest DRBD packages from DRBD project’s sponsor company link http://oss.linbit.com/drbd/ and compile it from the source. Method 2 : Enable EPEL repository on RHEL7, CentOS7 and SL7. We prefer method 2, which enables the EPEL repository. So install the EPEL Repository on both nodes. Import the Public Key on both nodes. Note : If you get any error as public key is not installed on any nodes, import all the public keys available in the directory /etc/pki/rpm-gpg/ as below and repeat the installation again. On both nodes, load the DRBD module manually or reboot the nodes. On both nodes, Verify the module loaded or not. Lets Create a DRBD resource file “testdata1.res”. We recommend to always create a unique name to identify the resource purpose. It should be end with “.res” file extension. Copy the below simple configuration content into the file testdata1.res. Protocol C - Resources are configured to use fully synchronous replication (Protocol C). To know more about this just refer this link - Understand the replication protocol. on node1 - To define first node name and its options within the statement. disk /dev/vgdrbd/vol1 - To define the dedicated local disk used for replication. address 172.16.2.62:7788 - To define the dedicated network to be used for the replication and resource uses TCP port 7788.
meta-disk internal - Defined to use internal Meta data. Copy the DRBD resource file to other nodes. On both nodes, create LVM disk because we have defined /dev/vgdrbd/vol1 in the configuration file. We can also use the block devices as /dev/sdb if you dont prefer LVM. 6. Initialize the DRBD meta data storage. On both nodes, use “drbdadm” command to initialize the meta data storage. Above commands will give an output like below. Starting and Enabling the DRBD Daemon. On both nodes start simultaneously one after another.. Lets define the DRBD Primary node as first node “node1”. Use "--force" if you get any error to make the node primary forcefully. On first node “node1”, create a file system, mount the volume and write some test “index.html” content. Lets create a cluster resources of IP Address, Httpd, DrbdData, DrbdDataClone, DrbdFS on first node which are the resources required to bring up on the other nodes in case of any failures. Where, VirtIP is the resource name. ocf:heartbeat:IPaddr2 define three things about the resource to add. The first field ‘ocf’ is the standard to which the resource script confirms and where to find it. “pcs resource standards” is the command to list the available resource standards. The second field (heartbeat) is standard-specific; for OCF resources, it tells the cluster which OCF namespace the resource script is in. “pcs resource providers” is the command to list the available OCF resource providers. The third field (IPaddr2) is the name of the resource script. “pcs resource agents ocf:heartbeat” is the command to see all the resource agents available for a specific OCF provider. Set Constraint priority and order to start and stop. Integrate DRBD resource to the cluster. 'pcs' is the utitility to queue up several changes into a file and commit those changes automatically. Create DRBD data device resource. Where "testdata1" is the DRBD resource name which we have created in the configuration file.. Create a clone resource to allow the resource to run on both nodes at the same time. After you are done with all the changes, you can commit them all at once by pushing the drbd_cfg file into the live CIB. Lets create a filesystem resource to mount the DRBD device on the mountpoint. [root@node1 ~]# pcs -f fs_cfg resource create DrbdFS Filesystem device="/dev/drbd0" directory="/var/www/html" fstype="ext3"
Set Constraint priority and resource order to start and stop for the resources. By default, the operation timeout for all resources' start, stop, and monitor operations is 20 seconds. we will adjust the global operation timeout default to 240 seconds. Currently all the resources are running on node1, Lets stop the cluster on node1, so all the resources should fail-over to the second node “node2” without any issue.. Cluster is stopped on node1. Lets go to node2 and check the status. All the resources are running on node2 as expected. So fail-over happened successfully. So we can access the web server from the node2 now. We have more articles to be updated soon. To not miss any updates, Follow us on social networking sites @Learnitguide and Subscribe us on our Youtube channel @Learnitguidenetblog.